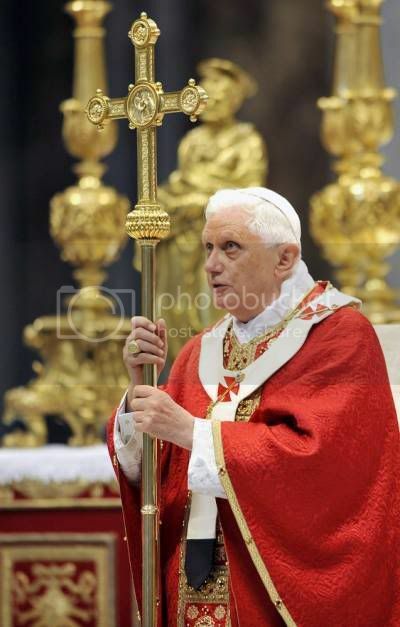 In the beginning of his Pontificate, Benedict was wearing this awesome ancient pallium. Now he's back to that ugly neck tie thing. What gives? They got rid of Marini 1. I prefer the newer pallium - it's much less awkward. 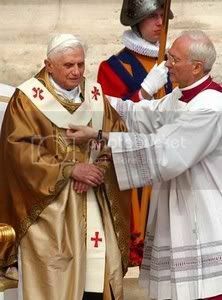 Was he the guy responsible for all those ugly vestments in the beginning? didishroom Wrote: Was he the guy responsible for all those ugly vestments in the beginning? I'm glad that the new Marini does not think that Easter-Egg-Tie-Dyed-Blue-Yellow-Vomit is an appropriate color for the Chair of Peter. That first picture looks like the Holy Father was involved in a painting accident. If you study the history of the pallium, you will see that in the Roman Rite the tendency is toward truncation. The "new" pallium better represents the history of the Roman Rite pallium. The first Marini's long, awkward thing was an antiquarian throwback to the first millennium. The pallia of the first half of the twentieth century were, if anything, more in the "necktie" mode than even Pope Benedict's current pallium. If you read the article at "The New Liturgical Movement" on the history of the pallium, you will see that some people think that the paintings of Innocent III in a large pallium are anachronistic, i.e. the pallium at that time was already much smaller than those paintings would have us believe. Apparently there is evidence to think this.